I haven't gotten to do much new game work lately, so I thought I'd document some experiences I had several months ago when trying to use the XNA content pipeline. It took me a while to figure this stuff out from the various blog posts and document pages out there, so maybe it will be of use to someone else. The XNA pipeline has quite a bit of pre-baked functionality, such as creating textures from images, importing models, and compiling effects. It also provides a great framework for custom behavior, which is what we're going to be doing here. Q Games is making some really cool stuff in my favorite city in the world: Kyoto. I was inspired by the game Shooter, published under their PixelJunk label, which performs extensive 2D fluid simulation on the PS3. I did some fluid sim stuff back in college that was always a blast to work on, and I really miss getting to play around with the physically-based side of computer graphics. The wow factor is huge, and Q Games found a great way to make a fun game out of it. Jaymin Kessler did a great GDC presentation last year about it, called Go With the Flow! Fluid and Particle Physics in PixelJunk Shooter. After seeing that presentation, I wanted to start messing around with ideas for a "fluid" tower defense. I thought it might be cool to do something like "Defend Pompeii!" set in an alternate reality where Vesuvius is erupting and you have to use freeze ray towers to solidify the lava coming down the mountain before it gets to the town. The solidified lava could form barriers that slow the flows down even further and give you time to use other types of towers. An alternative theme could be a "ball pit" factory gone haywire, and you have to stop the wave of plastic balls before it hits the city. It might be some pretty sweet eye-candy if you did a particle-based fluid simulation where the particles are different colors, to represent the balls. I started experimenting using PhysX, which I'd never used before. I'm using an open-source managed wrapper for PhysX, called PhysX.Net. PhysX, like other NVIDIA products I've used, is an odd beast. The product seems solid, even if the API feels a little over-engineered. However, the developer website is atrocious, and documentation is spotty at best. You can find amazing videos of demos, but no actual code of the demos themselves, which seems to defeat the purpose. I'm not sure where the PhysX community "hangs out," but I must have been looking in the wrong places; either way, I don't like programming in a vacuum. I didn't get very far into prototyping before I was defeated by performance, or rather, lack thereof. But, I did get to play with the content pipeline, so it wasn't a complete loss! I wanted to begin with fluids interacting with a terrain. This meant I'd need to create a heightfield in PhysX, and a heightfield for display. I wanted to describe levels in XML, so I could easily create a level editor tool and eliminate the need to have assets and parameters hard-coded. I also wanted to compile assets to binary format, as opposed to using the XML to read in assets at run time. In the XNA content pipeline, you begin with an importer, which reads the assets you include in the project. Next, the imported assets are processed using a (what else?) processor, which creates the binary content files from the imported objects. These binary files are read at runtime to load content. After creating a basic description of levels as an array of LevelFileFormat objects, I created a custom LevelsProcessor, to generate content from the imported XML. All custom processors in XNA inherit from ContentProcessor, which is a generic class that specifies the input asset and outputs the processed content to be written. Additionally, all processors must be marked with the ContentProcessorAttribute. To create an XNA model, you need a triangle vertex list. XNA provides a class to describe a model's content, called ModelContent. To create a PhysX HeightFieldShapeDescription, you must first create a HeightFieldDescription, for which you need the number of rows and columns in the heightfield, as well as a list of the height values. I created a class to contain this information, called HeightFieldDescriptionContent. HeightFieldDescriptionContent and ModelContent each require their own processors. Their processing is kicked off by the LevelProcessor, using the ContentProcessorContext that is passed in to each custom ContentProcessor. The HeightFieldModelProcessor comes from the Microsoft example of generating a heightfield model using an image as a source for geometry, so I won't cover the details of that processor. Suffice it to say, it generates a ModelContent object. The HeightFieldDescriptionProcessor is simpler. It gets the width and height of the heightfield image, and sets the content columns and rows. Then it goes through each pixel of the image, reads the pixel value, and uses that as the height of the sample. This means that as the binary content files are being deserialized, a Model and HeightFieldShapeDescription will be created. However, a HeightFieldShapeDescription requires instantiation using the PhysX runtime, which XNA knows nothing about. This is where things get cool. PhysX provides a simple method of displaying the internal representation of a Scene, which can be useful for debugging. If you run the game in debug build, you will see this PhysX debug display on top of the XNA model. 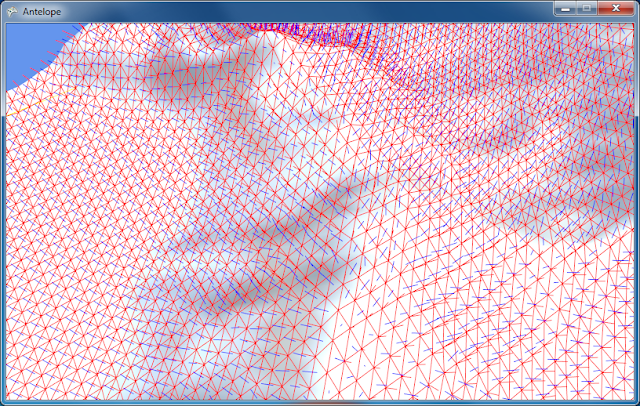 PhysX debug display in tandem with the XNA model of the terrain. And there you have it. I'd be excited to have another opportunity to experiment with the XNA content pipeline. After this prototype, it seems like a very flexible API, and I get the impression there are many ways to approach the problem of getting assets into your game. You may know a better way than what I've done here. If so, by all means, fire away in the comments below! I'm anxious to learn this stuff the best way possible.